It fell by 0.6 percentage points over the last quarter to 4.0%, equalling the figure for March to May 2008. 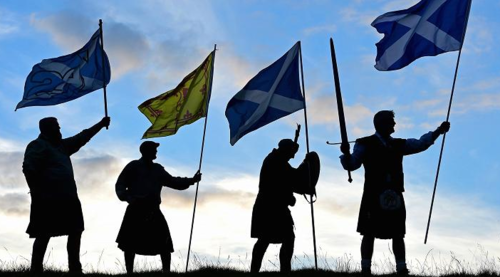 It is a welcome slice of good data for the Scottish economy which has slowed. The country saw GDP contract 0.2% in the fourth quarter of 2016 contrasting with UK-wide growth of 0.7%. 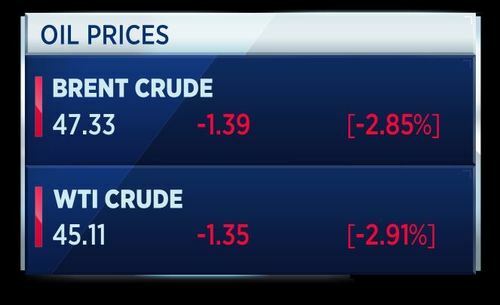 CNBCA leading global energy market academic warns oil prices could sink back to $30 a barrel if OPEC fails to make additional output cuts. 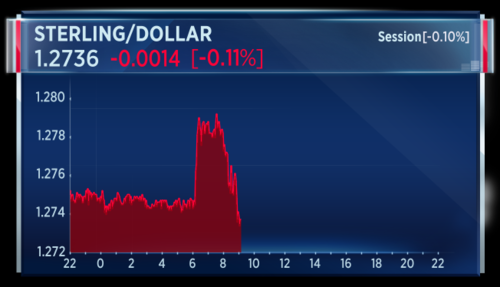 Sterling has decided to move to a session low following that poorer than expected UK labor and wage data. The main takeway is that earnings, after inflation is accounted for, is shrank at the fastest rate since 2014 in the three months to April. 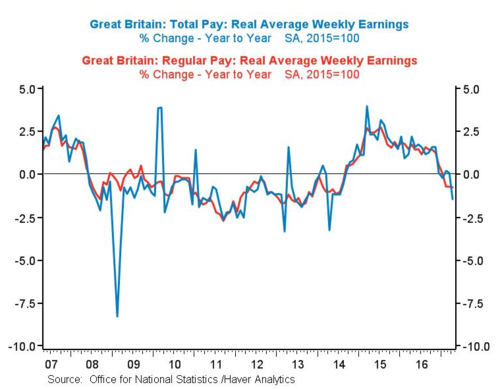 This is a graphical representation of the real wage squeeze from Haver Analytics. The BBC is reporting that the London tower block fire which has caused an unknown number of fatalities will mean a rescheduling of any deal between the U.K. Conservative Party and the Democratic Unionist Party of Northern Ireland. The DUP is to support the Conservatives in parliament in order to allow Theresa May to continue as Britain's leader. This delay could, in turn, delay Brexit talks set to begin on Monday next week. The European Parliament's Brexit co-ordinator, Guy Verhofstadt, is upping the pressure on U.K. Prime Minister Theresa May. 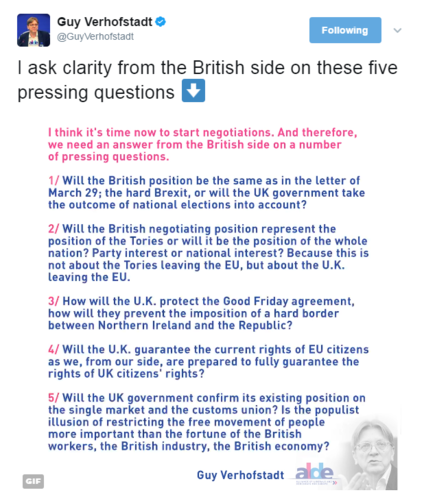 He wants her to come up with answers to 5 Brexit questions. 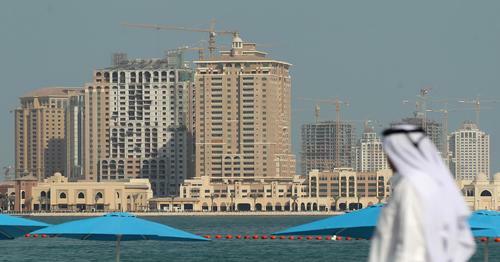 CNBCThe ongoing dispute between several Middle East countries and Qatar is causing "logistical headaches", the International Energy Agency (IEA) warned Wednesday. 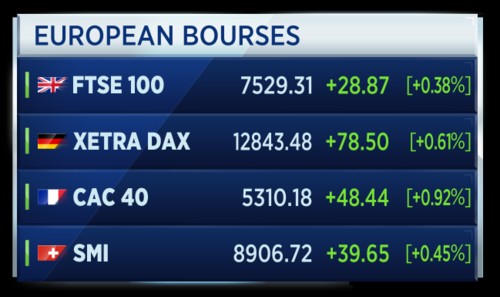 European markets moved higher on Wednesday as investors cautiously awaited the latest monetary decision by the U.S. Federal Reserve. 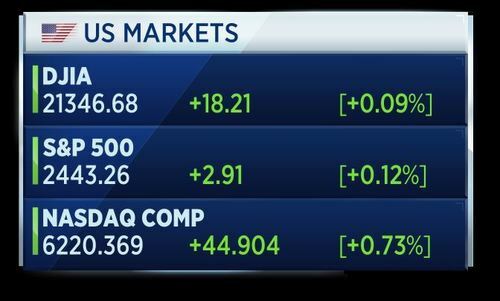 Tech stocks led the gains in early trade as they recover from a major sell-off earlier this week. Basic resources stocks also moved higher following news that the Chinese firm Fosun is to offer more than £224.6 million ($287 million) for the London-listed miner Gemfields, Reuters reported. The stock was thus up by 9 percent. 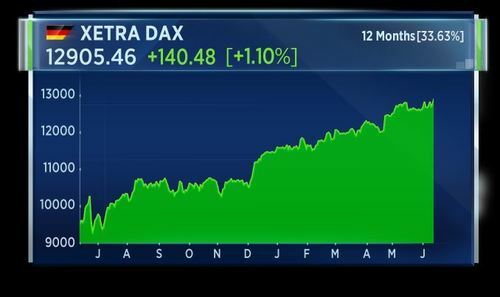 The Swedish firm Hexagon was at the top of the European benchmark in early deals, up by 16 percent. This after reports that the software company was in talks to sell itself to a rival in a deal valuing the company at about $20 billion. According to the Wall Street Journal, Hexagon may ultimately decide not to pursue a sale. This is what happens across America when teh Fed raises rates. 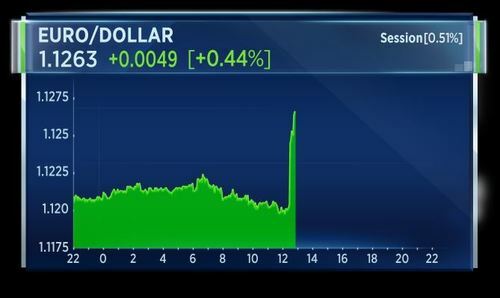 CNBCWhile it may not sound like much, the Fed's move to hike its benchmark interest rate target up a quarter point will have ramifications. The London Metropolitan Police force have confirmed 6 casualties in the tower block fire in West London. They expect the number to rise. Our thoughts are with everyone involved in this truly shocking fire at Grenfell Tower. I can confirm six fatalities at this time but this figure is likely to rise during what will be a complex recovery operation over a number of days. Many others are receiving medical care. The satirical magazine Private Eye is publicizing its new cover. Stocks have been on a strong run since the election of Donald Trump. They did pretty well under 8 years of Obama too. Is there just too much money in the system? What will happen when the Federal Reserve starts to give back its assets to the Treasury? London Ambulance says 64 people taken to hospital following London tower block fire. 20 people currently in critical care and further 10 people made their own way to hospital, taking the total treated to 74. That's according to Reuters. UK Prime Minister Theresa May says deeply saddened by tragic loss of life in London tower block fire. She has asked for cross-government meeting to take place at 1500GMT on London fire. That's according to Reuters. 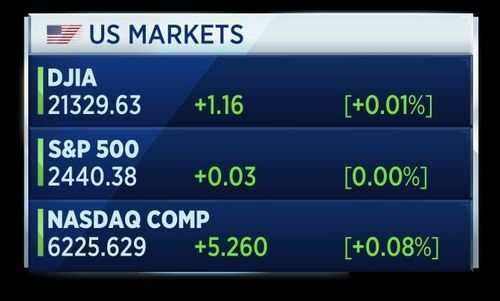 U.S. stock index futures pointed to a higher open on Wednesday after markets closed at new highs Tuesday following a rebound in technology stocks. 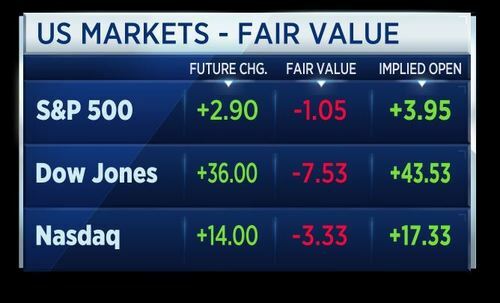 Dow futures rose 33 points, while S&P and Nasdaq futures gained 2.5 points and 13.50 points, respectively. 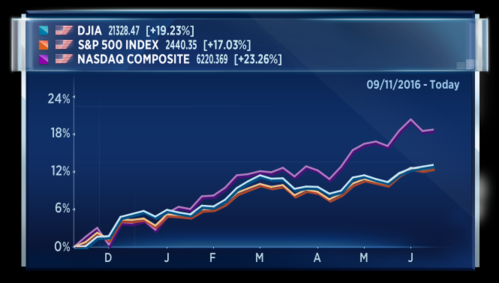 Notable technology names like Nvidia, Amazon, Tesla and Alphabet all saw their stock prices rise before the bell. London Police says there may be people within the building who are unaccounted for after London Tower block fire. That's according to Reuters. German Finance Ministry spokesman when asked about meeting of Eurogroup on Thursday, says we assume that we will be able to agree to a sustainable overall package on Greece. When asked about debt relief measures, he said it remains the German government's view that the measures Greece needs can only be decided on after current bailout. 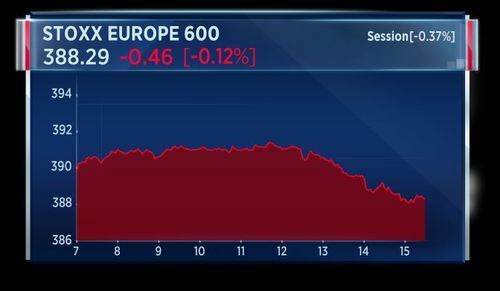 German Finance Ministry spokeswoman says no guarantee there will be debt relief for Greece. Reuters is reporting that gunshots fired at gathering of Congressional Republicans in Virginia. Police investigation shows multiple shooting in Alexandria, believe suspect arrested. Reuters has also reported citing CNN that two Capitol Police officers shot at gathering of Republican lawmakers in Virginia. A shooter was reported Wednesday near a congressional baseball practice field in Alexandria, Virgina, according to a report by ABC 7 News. MSNBC has reported that House Majority Scalise and two Capitol Hill Police officers who were shot appear to be in stable condition. President Trump releases statement on shooting at congressional baseball practice. 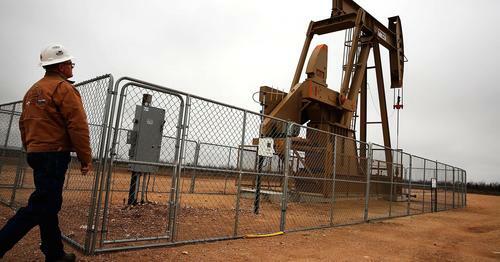 The U.S. Consumer Price Index was forecast to rise 0.2 percent in May, after inching up 0.1 percent a month earlier. 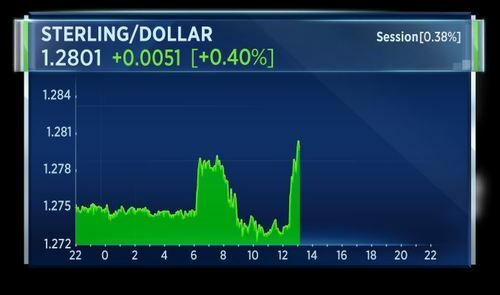 Sterling climbs above $1.28 for first time since UK election as dollar weakens further. CNBCU.S. 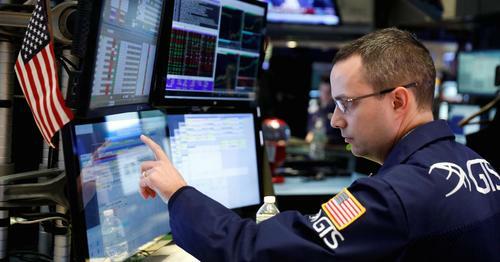 equities opened higher as investors braced themselves for the latest monetary policy announcement from the Federal Reserve. 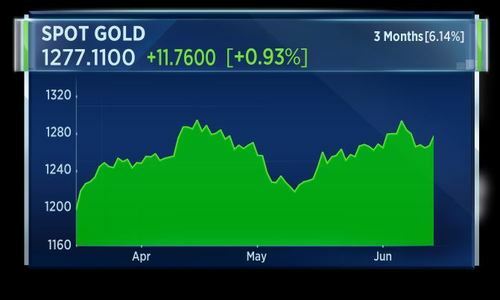 Gold rose 1 percent on Wednesday after weaker-than-expected U.S. inflation data for May knocked the dollar index to nine-month lows ahead of a keenly awaited Federal Reserve policy statement. The U.S. central bank is widely tipped to unveil a quarter-point interest rate hike at the end of its latest two-day meeting at 1800 GMT, lifting the Fed funds target rate above 1 percent for the first time since the aftermath of Lehman Brothers' collapse in 2008. U.S. Secretary of State Rex Tillerson says China's cooperation in putting pressure on North Korea has been 'notable, but uneven'. That's according to Reuters. 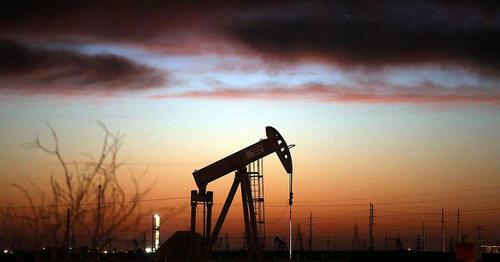 Oil fell on Wednesday after reports showed global supply was rising and U.S. crude inventories were still increasing, fueling concerns the market could remain oversupplied for longer than expected. 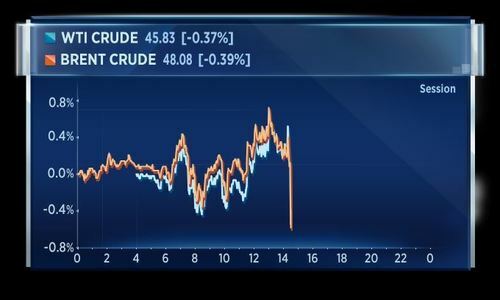 CNBCOil prices fell after data showed a build in U.S. crude stocks and OPEC reported a rise in its production despite a pledge to cut output. CNBCThe man who allegedly opened fire at a congressional baseball practice has been identified as James T. Hodgkinson, NBC News reports. And that's all from us here at World Markets Live. 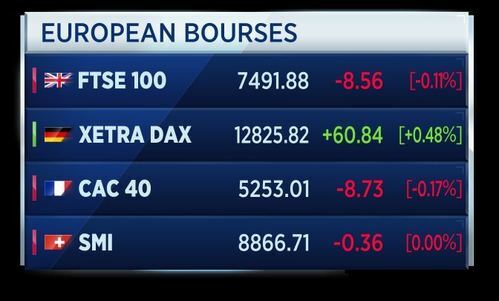 Join us again tomorrow from 0600GMT for more news, views and analysis. Till then, have a nice evening and see you soon!